The man who put La Gloria Cubana cigars on the map has returned to once again put his stamp on the legendary brand with the La Gloria Cubana Colección Reserva. Master blender E.P. Carrillo based the blend for the Colección Reserva on a tobacco recipe he originally created in the 1980s, wrapping a silky Sumatra-seed leaf around the richest of Nicaraguan reserves. Handmade at Ernesto’s Tabacalera La Alianza factory in the Dominican Republic, the Colección Reserva offers you a balanced smoke with dense full flavor and a natural sweetness, along with the fine craftsmanship you’ve come to expect. A must-smoke for any true La Gloria lover. 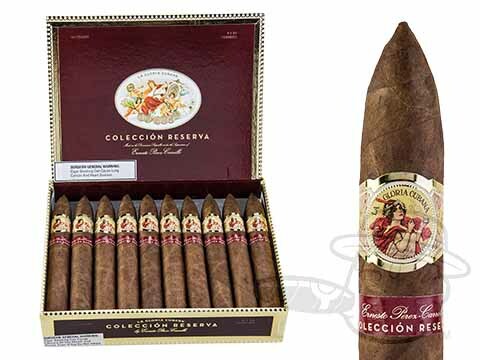 La Gloria Cubana Coleccion Reserva Torpedo is rated 2.2 out of 5 based on 1 customer ratings.